Mobilegeddon: Is It All About The Money? Google has a problem with mobile. That might sound like a strange statement to make. After all, the search business has been a strong exponent of the ‘mobile first’ approach. They also own the most popular smartphone OS, Android, and they have the most widely used apps on all platforms. Their problem, though, is one of money. When it comes to advertising, mobile is worth less to Google. In May 2014, Comscore identified that 60% of user time spent in digital is on mobile devices. Searches from smartphones are also increasing at 10 times that of desktops. However that trend is not matched by a corresponding shift in revenues. 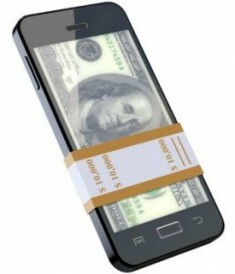 The same Comscore study found that mobile represents just 13% of the money spent in digital retail. With lower conversion rates, bids for advertising are also less. So, as we become more mobile that means one thing for Google: less money. Their average price for advertising has fallen by 4% since 2014. Facebook has compounded the problem by increasing their mobile ad offering. Mobilegeddon: are you mobile friendly? Which brings us to ‘mobilegeddon’. Google made a major algorithm update on 21st April that includes mobile friendliness in their search rankings; loading speed, responsive design elements and mobile best practice are now factors in search results. Google are trying to improve the user experience on mobile and at the same time, they are favouring responsive design in order to align the content with desktop. Some observers have suggested that some of the thinking behind this change is to bring mobile and desktop search together, to stop the attrition in their ad revenue. Understandably any major change in the rankings causes some concern, especially with smaller businesses that primarily rely on Google for their traffic. Brands that have no mobile optimization appear to have been effected. For example, Search Engine Watch found that Ryanair’s desktop only site performs poorly in Google’s tool and their search results have suffered. There’s no need to panic just yet. Mobile friendliness is one of many search ranking factors, of which content relevance and inbound links remain the most important. However, businesses should still aim to adopt mobile first responsive design for their sites. Regardless of their reasons, Google is clearly committed to that approach for the long term. And that makes sense. In spite of the lower conversion rates, mobile is becoming core to web experiences. Users may buy less, but there is an increase in researching products on smartphones makes it an essential channel at the top of the sales funnel. With an increasingly mobile world, responsive design offers the best solution that ensures the right engagement for the majority of users. Mark Brill leads Emarketeers’ marketing technology course, providing insight into the creation and implementation of mobile first, Google-friendly websites.